Francisco Benítez was raised in New Mexico, New York, and Spain. His mother, flamenco dancer and choreographer, Maria Benitez; and his father, Cecilio Benitez, a Spanish set designer, influenced his subsequent interest in tenebrist painting and baroque art. Benítez studied Classics at St. John’s College (Santa Fe), and then academic painting techniques and anatomy/figure drawing at the Art Student’s League in New York City. 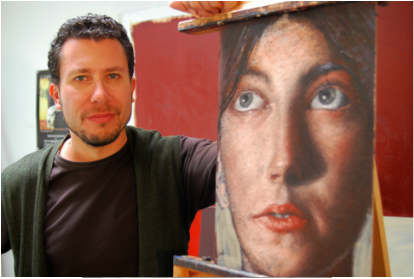 Benítez subsequently obtained his Bachelor of Fine Arts degree from the University of New Mexico, during which time he studied abroad at the Facultad de Bellas Artes in Granada, Spain, through an exchange program, and later did graduate-level independent study. Benítez lived in Southern France for over four years, during which he participated in a number of museum shows. He exhibited at the Musée d’Art Moderne et d’Art Contemporain de Nice, and co-organized, curated, and participated in an exhibition featuring cutting-edge New Mexico artists at the Musée Denys-Puech in Rodez, France. Benítez also had several one-person and group shows in Southern France as well as in Paris. At present, Benítez divides his time between Europe and Santa Fe. His active exhibition schedule in the US is enhanced by projects in France and Italy. Since 2002 he has participated in high-profile one-person and groups shows in Italy, mostly in Sorrento, Syracuse, Messina, Noto, Catania, Rimini, and in Tuscany. He participated in Imperium, curated by Dr. Thomas Noble Howe and Edward Lucie-Smith in 2010, at Southwestern University, Texas. In 2014 he developed the “Doña Inés Lost Her Slipper” project, for which he ran a successful Kickstarter campaign. The show was featured at the Santa Fe Community College Visual Art Gallery in the fall of 2014, and got much critical attention. It then traveled in 2015 to the Palazzo Nicolaci, in Noto, Italy—a living 18th century museum. It will travel to a the Real Jardin Botanico in Madrid, next to the Prado, in May of 2018. Benitez’ work is included in numerous private collections, some high-profile, such as Jean-Paul Gaultier’s, throughout the United States, as well as in France, Italy, Australia, Mexico, Canada, Sweden, etc. His work is on permanent display at the New Mexico State Legislature’s public art collection, as well as at the National Hispanic Culture Center and the Conseil Général de l’Aveyron in France. He has lectured on painting of the baroque period, as well as having his work featured on the covers of various books and publications.